All in one Free simple Burning Studio. Write all types of files such as digital photos, pictures, archives, documents, music and videos to CDs, DVDs and Blu-ray Discs. 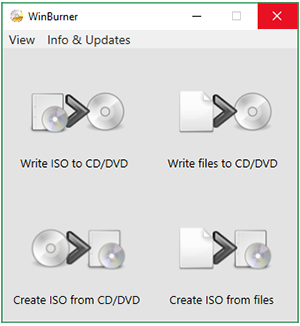 With WinBurner, you also be able to create bootable or multisession discs, high-quality Audio CDs and Video DVDs, create and burn ISO images. We recommend that you download the installer, the portable is only for pendrive.